Last month we discussed press capacity, coil-feed-line capacity, feed accuracy and coil payout—four areas with which die-setters must be familiar to ensure safe and accurate setup of stamping dies. This month we turn our attention to lockout-tagout and counterbalance pressure—two topics that affect die-change procedures. Any person tasked with changing or setting dies, including the tool and die maker setting a new die for initial tryout, must understand both to minimize risks. Most presses include a chart that specifies the correct pressure setting for various upper die weights, similar to the one shown here. Companies following the OSHA lockout-tagout standard for die setting have written policies and specific lockout-tagout die-change procedures. Designated and trained employees lockout the press in accordance with the OSHA standard and their companies’ written procedures. Companies also must identify and designate affected employees and instruct them on the purpose of lockout-tagout while stressing the importance of never removing a lock. It is important to note the distinction between authorized and affected employees. For a required die change, authorized employees involved in the die change use a specific lock assigned to them to lock out the affected equipment. An authorized employee must notify affected employees prior to locking out the equipment and again after removing the locks. Understanding hazardous energy and closely following company procedures related to lockout-tagout during die change are crucial. For example, on a part-revolution clutch press, OSHA wants the main power-disconnect switch and air supply to the clutch locked out. However, locking out the air supply to the counterbalance, or exhausting the air to the counterbalance cylinders, should not occur. The reason: The counterbalance energy, which is not hazardous, helps support the ram (slide). Some die-setting activities cannot be performed without electrical energy. These include inching the ram to different positions required for a die change or when altering shut-height using motorized shut-height adjustment. In these instances, safeguarding devices that protect operators during production can be an important part of reducing risk during die changes. Properly applied light curtains that detect the die setter(s) at all positions outside the press bed, and which prevent stroking or cycling of the press can be an ideal safeguarding method, providing the devices are set up to be active in the inch mode. Press-slide counterbalance systems, found on all but the smallest presses, offset or neutralize the weight of the press ram and upper die assembly. One method of counterbalancing is an air counterbalance system. This requires the setup person to adjust a pressure regulator to a value that will neutralize the weight of the slide and its upper attachments. Safe operation requires the correct adjustment of the press counterbalance. Most presses include a chart that specifies the correct pressure setting for various upper-die weights, similar to the one shown in the figure. Presses designed for quick die change (QDC) may have an automatic counterbalance adjustment feature. In most cases, the setup person determines the correct pressure setting and manually enters it into a database. Correct data entry and careful maintenance of all systems functions are essential. During die setup, a properly adjusted counterbalance neutralizes the weight of the ram and tool on the shut-height adjusting screw(s). This makes it easier for the adjusting motor to rotate the adjustment screw(s) and helps prevent premature wearing of the adjusting screw(s). A balanced press ram also helps reduce drivetrain gear wear and allows the press to operate more quietly, while improving stopping time. In production, a properly adjusted counterbalance system reduces the effective weight that the drive system must lift after the press has gone through the bottom of its stroke. This permits all of the electric motor’s energy to go toward regaining flywheel speed that was lost stamping the part rather than wasting the motor’s energy on lifting the ram. How important is counterbalancing? 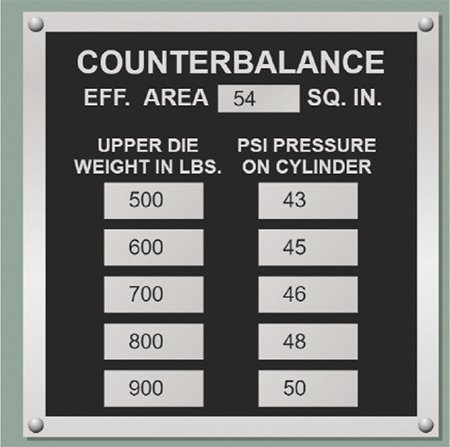 Important enough that OSHA requires information regarding upper die weight be made available to the die setter to enable proper counterbalance adjustments. The total die weight of the die assembly also must be known to avoid overloading die-handling equipment. Stamping the upper and total die weight on the die is the required method, unless the company can make available a foolproof alternative, such as written instruction—including the upper-die weight. OSHA requires that the weight be stamped and not marked or painted because stamping this information eliminates the risk of repainting an incorrect figure on the die. Retrofitting older presses with integrated controls having tonnage-monitoring capabilities together with automatic shut-height and counterbalance adjustment functions can greatly improve die-setting time, accuracy and consistency.